Fluidtec Booster sets are ideal for constant pressure variable flow situations such as supplying mains pressure water to subdivisions and small towns, high rise buildings and stock water on farms. 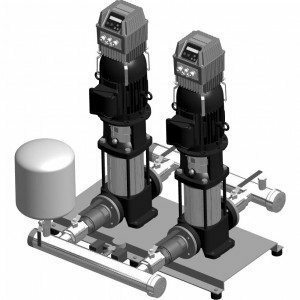 They typically consist of 2 or 3 pumps complete with a variable speed control system for ultimate flow flexibility. Note that the below features and benefits apply to a standard duplex booster set. Thus the features and benefits only apply to this and not necessarily to other set ups (for example single and multi-pump sets, constant flow pumpsets, etc). Smart phone connectivity – an Android device (iPhone and Windows to come) can be used to change settings, fault find and allows remote access. Duplex booster sets are set up to run in duty/standby and duty/duty assist. This means that on low flows only one pump will run at low speed (minimising power consumption) and this duty pump will automatically switch every 48 hours for even wear. When higher flows are called for both pumps will run. Constant pressure regardless of demand – this makes them ideal for supplying water where there is variable demand. A classic example is supplying water to a subdivision where there is high demand in the mornings and evenings however very little demand in the middle of the day and middle of the night. The Fluidtec booster set is set to keep a constant pressure and the pumps will started, ramped up, ramped down and stopped according to this set point.